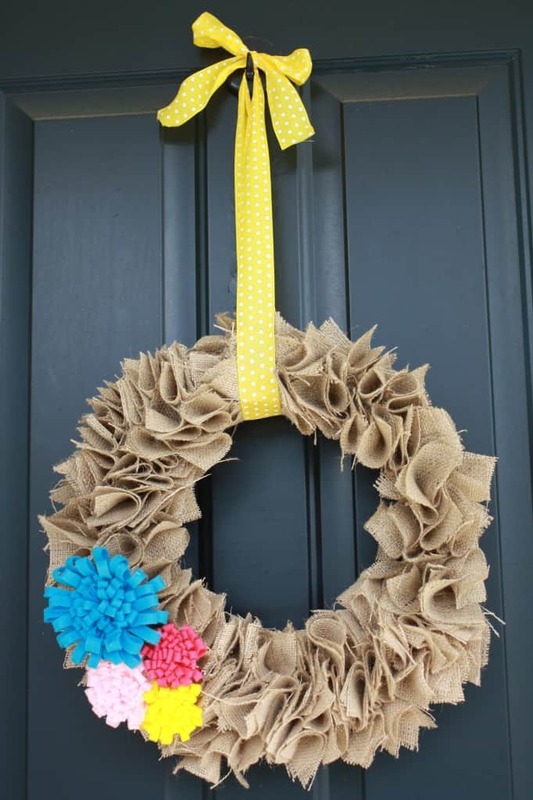 Easy DIY Burlap Wreaths That Will Make Your Neighbors Jealous! 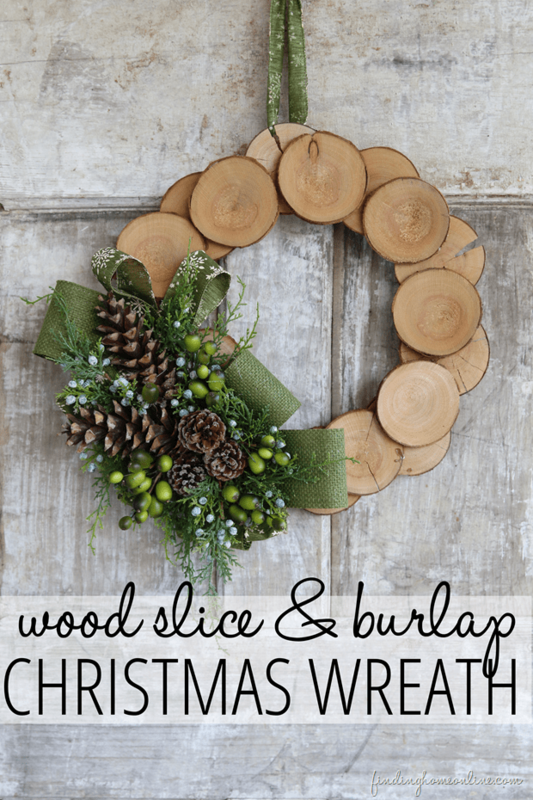 Home > Holidays > Easy DIY Burlap Wreaths That Will Make Your Neighbors Jealous! Easy DIY Burlap Wreaths: Welcome your guests at any time of year with one of these beautiful wreaths. From Spring wreaths to Christmas wreaths! 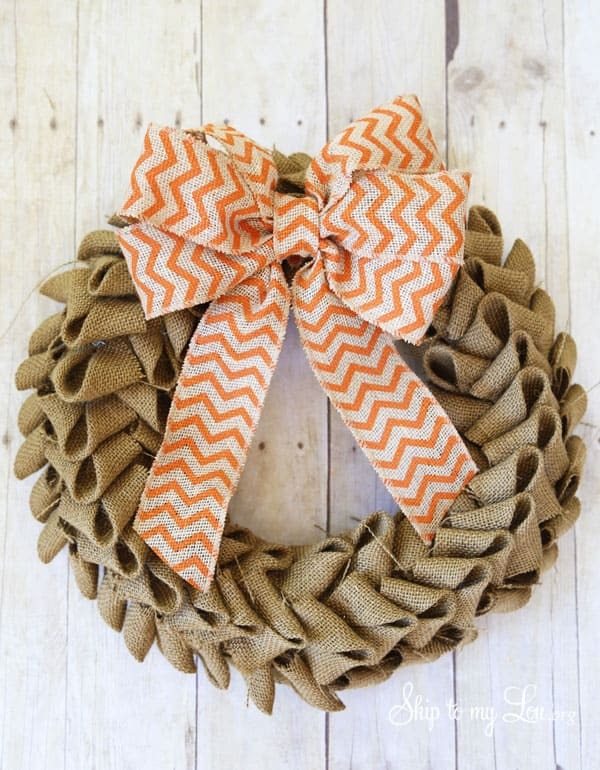 Welcome your guests at any time of year with one of these easy DIY burlap wreaths. From Spring wreaths to Christmas wreaths and everything in between! 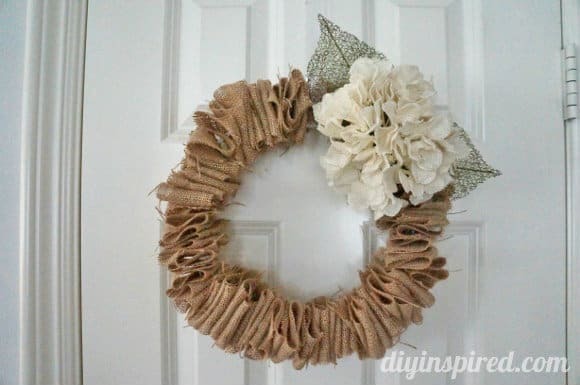 The great thing about burlap wreaths is that not only are they super simple to make but the materials don’t cost a lot which means a DIY burlap wreath will cost you much less than if you bought one in the store. 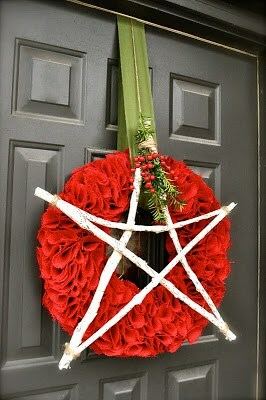 And once you have the basic wreath created it’s really easy to decorate it to match the season. So whether you want to add bunnies for Spring, skeletons for Halloween or poinsettias for Christmas you’ll have a wreath that can adorn your front door all year round! Burlap wreaths make great gifts too so once you’ve made one for yourself why not create something special for your mom or your best friend! 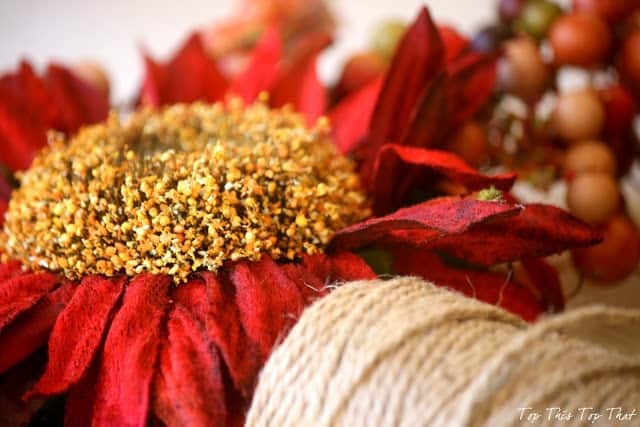 Making a burlap wreath is super simple, even if you’re not usually the crafty type. You can create a basic wreath in just ten minutes. We couldn’t find any burlap wreath kits in the store so we put together a list of supplies for you because if you’re anything like us it’s just easier to buy the stuff from Amazon! 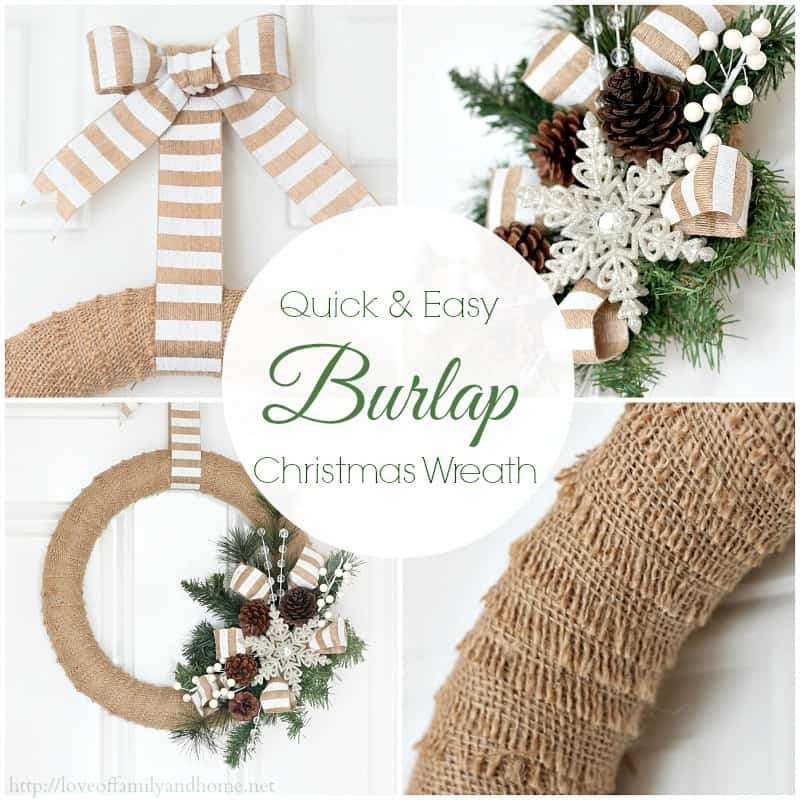 Here’s a video to show you just how simple it is to make a DIY burlap wreath. 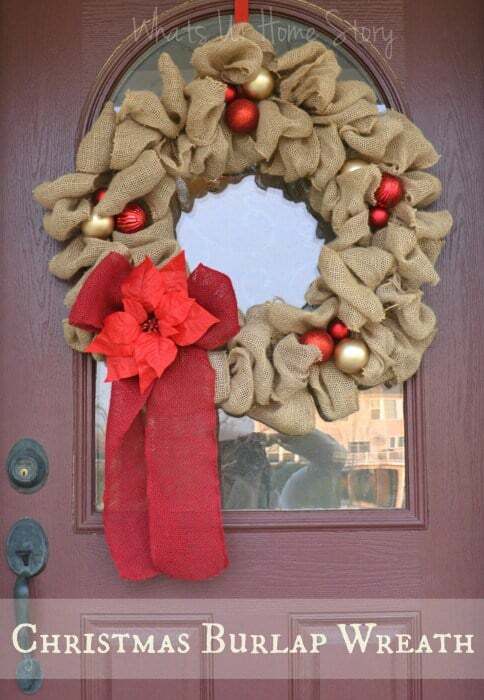 Of course some plain old burlap hanging on your front door is not going to knock anyone’s socks off – which is why you need some burlap wreath ideas to inspire you with your decorations. We’ve scoured the internet for the best looking wreaths we could find and then split the tutorials by season so it’s easy for you to find what you need. Most people think Christmas when they think wreath and these ideas are festive and stunning! Kimber saw a bubble wreath she loved on Etsy but didn’t like the 50 dollar price tag so she decided to make her own! Rather than a wire hanger she made her wreath using a styrofoam wreath form and attached the ribbon with ball head pins. It’s a beautiful wreath and I love the idea of making them in different sizes so that as well as hanging one on the front door you can hang them on your china cabinet too. We picked out this wreath because it’s made with coloured burlap ribbon. The green ribbon looks fabulous against that red door and the red burlap flowers really adds that festive feel! This red circle wreath is simply GORGEOUS! 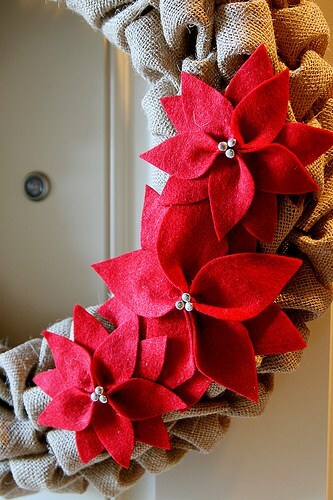 Again it’s made with a foam wreath form and used almost three yards of red burlap ribbon. We love the paper covered stick star that adorns the front of the wreath, and what a great idea to switch it to a heart for Valentine’s day! Here’s another super cute bubble wreath, this time decorated with some stunning red felt poinsettias. Vanessa recommends you use ball pins to create the wreath but she does use a glue gun to make the flowers. Vidya shows you how to take your simple burlap wreath and transform it for the festive season using Christmas baubles and a clip on poinsettia ornament. This is frugal crafting at its finest, just raid your box of Christmas decorations and get to work! Nothing screams Christmas like pinecones and snowflakes right? We love this wreath because it is so simple yet so elegant. It doesn’t get much easier than wrapping burlap ribbon around a styrofoam form and then pinning on a Christmas ornament! We loved her tip for using a magnetic wreath hanger too! Ok we might be pushing the boundaries a bit here because this wreath isn’t made from burlap, it’s made from wood slices, but it was too gorgeous not to show you, and it does have a burlap ribbon! 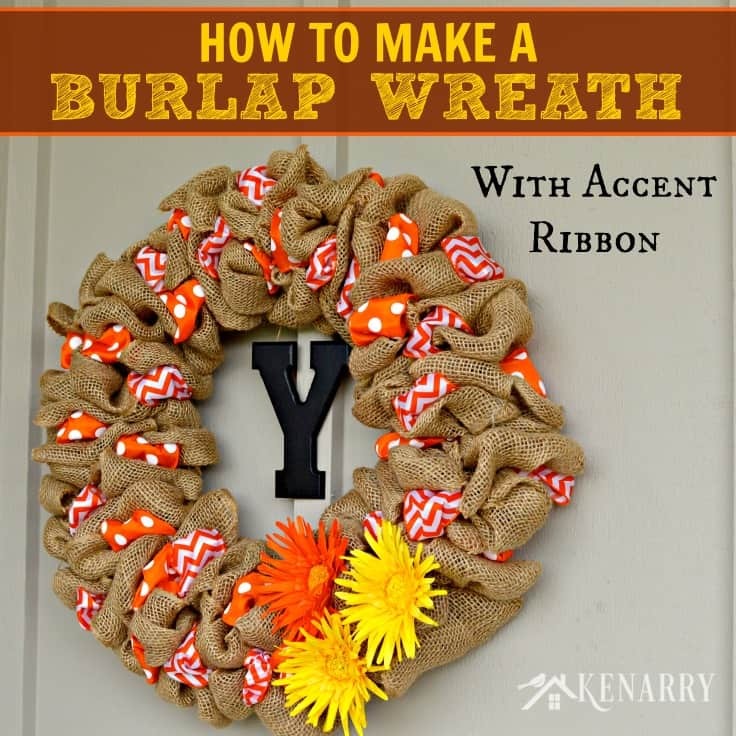 Ever wondered how to make a burlap wreath with a hanger? This tutorial is just what you need! This one uses just one yard of burlap and is adorned with a flower embellishment. 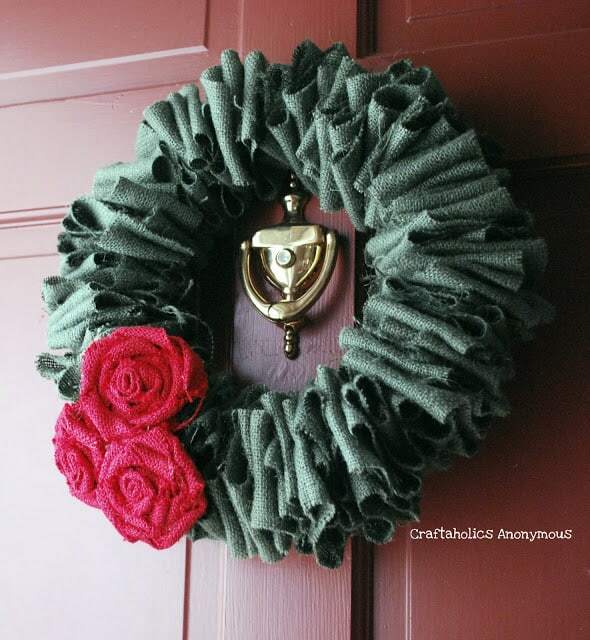 It’s the perfect sized wreath to hang on an internal door or in the window. 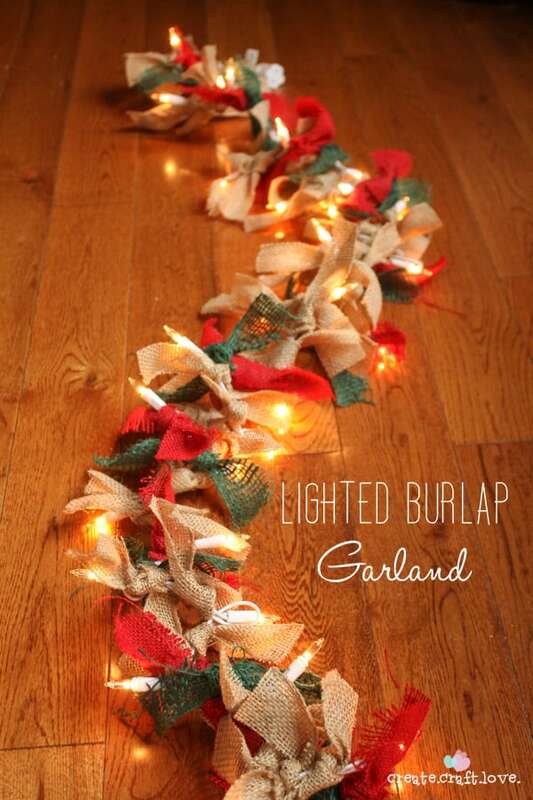 This tutorial is actually for a lighted garland to decorate your mantlepiece, but as soon as we saw it we thought it wouldn’t be too far a leap to turn this into a wreath. You’d just need to follow the steps but use a wreath form and then add some of these outdoor mini lights to light it up! 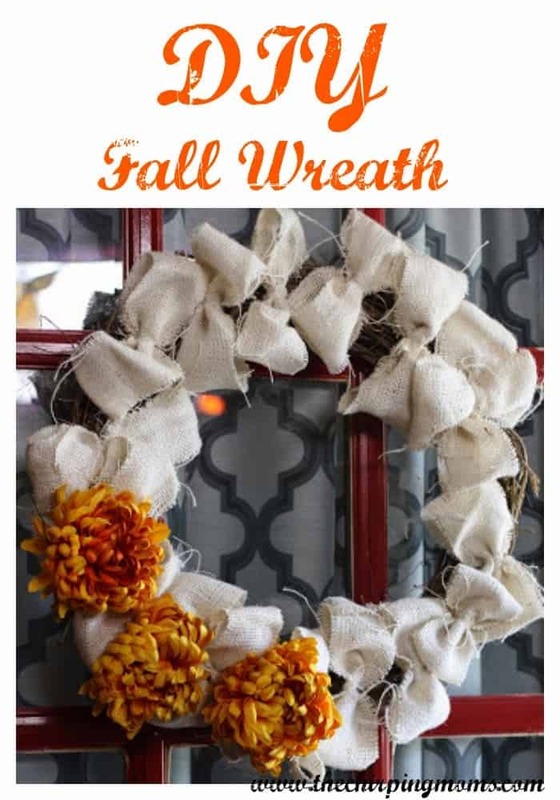 Here are some fabulous wreath ideas to get you in the mood for Fall. 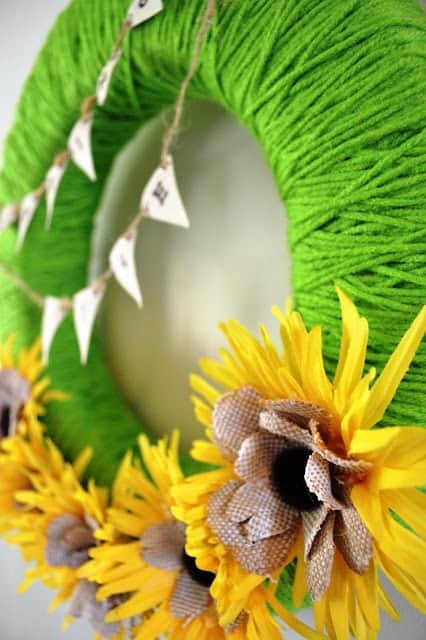 Cindy uses a straw wreath as the base of her design, and they come in a range of different sizes. The orange in the burlap ribbon just screams Fall doesn’t it? We love the colour scheme for this wreath, that sunflower is gorgeous, and what a clever idea to add a letter to really personalise it! 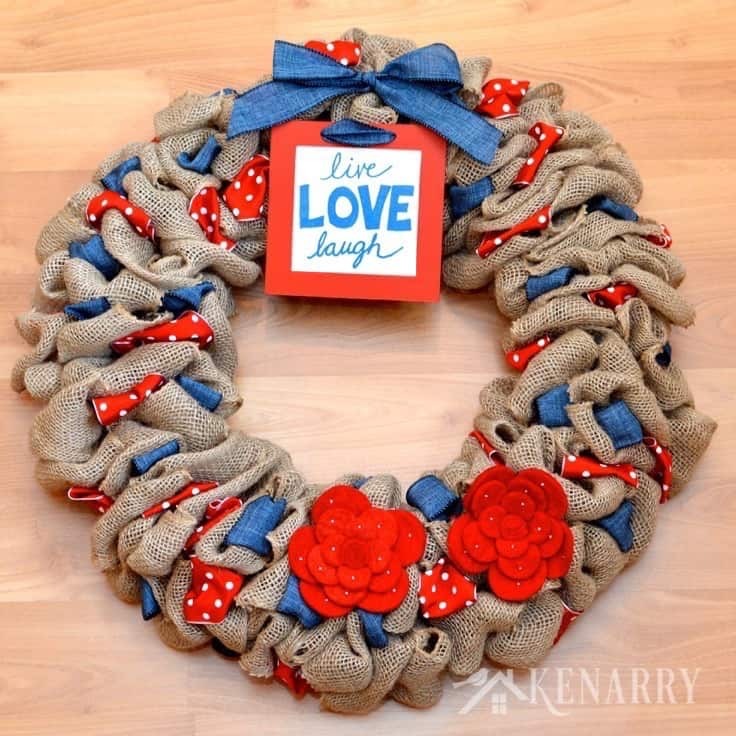 Here’s something a little different: the burlap is tied into bows and then attached to the wreath form. Since the wreath form itself will actually be on show you’ll want to choose a natural grapevine wreath like this one, but you won’t need as much burlap ribbon so it’s a great option if you have some leftover from another craft. 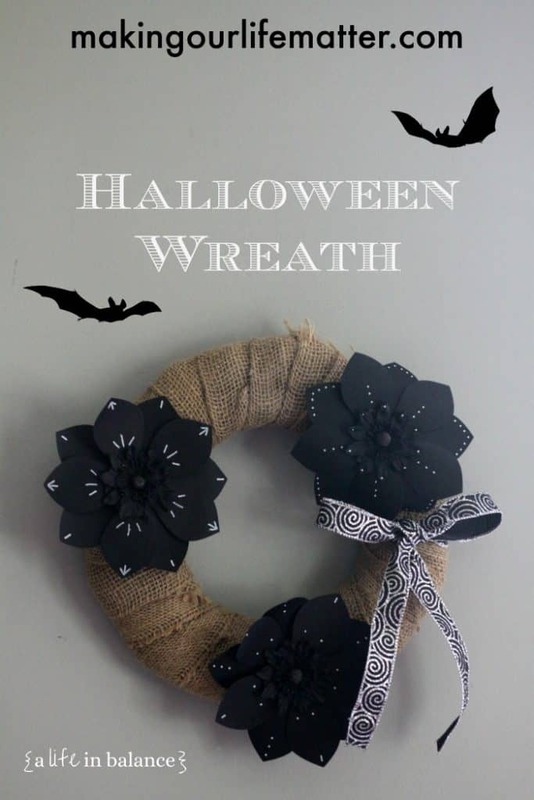 We really struggled to find some ideas for Halloween burlap wreaths, which is strange since so many people love to decorate their porches at this time of year. The ones we did find though will certainly impress the trick or treaters! 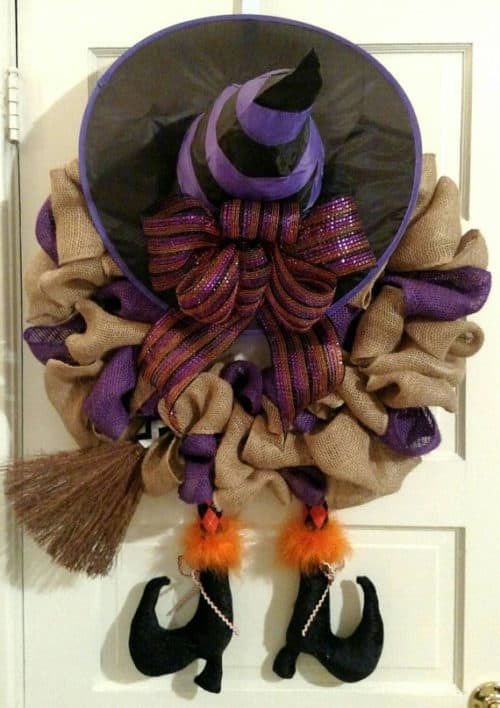 We LOVE this witch wreath, especially those shoes hanging down from the bottom (and if you switch it the color scheme to green it would make the perfect gift for a Wicked fan!). If you don’t have a lot of time to spare then check out this tutorial which shows you how to add black chalkboard flowers to your wreath for that Halloween feel. 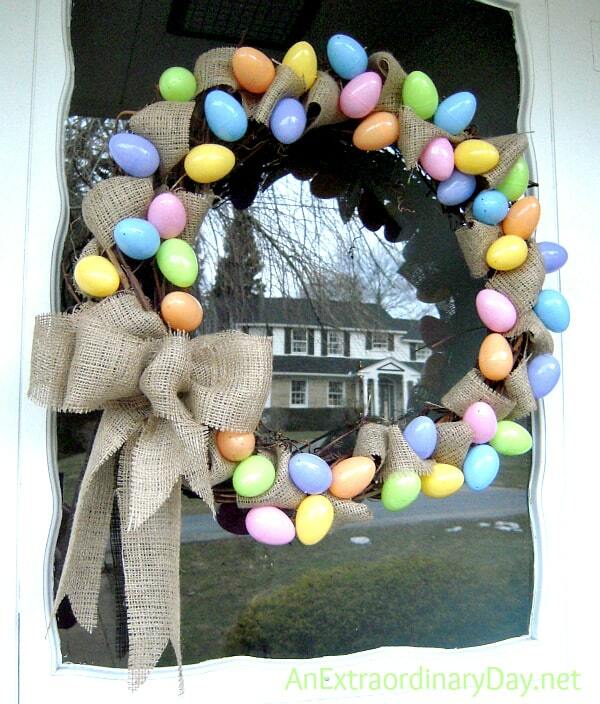 With the arrival of Summer it’s time to makeover your wreath with a beach or a patriotic theme. 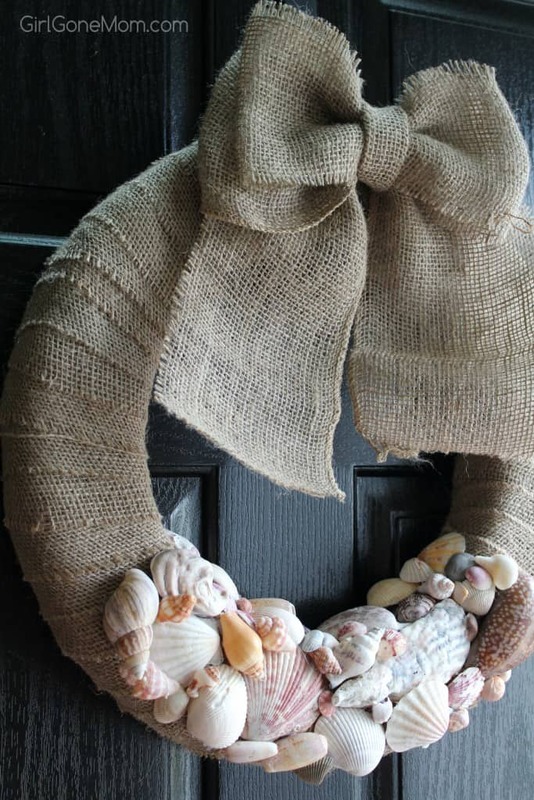 If your kids love to collect seashells when you visit the beach this tutorial will show you how to use them to decorate your wreath. What a lovely way to remember your vacation every time you step through the front door! 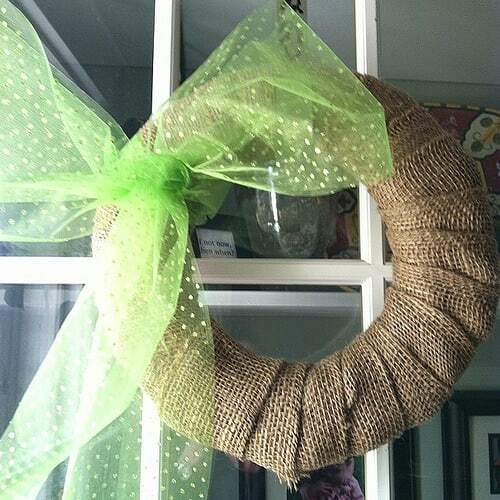 This is the first wreath design we came across where accent ribbons have been entwined with the burlap. The chevrons and polka dots really bring this wreath to life! Ready to celebrate the red, white and blue? 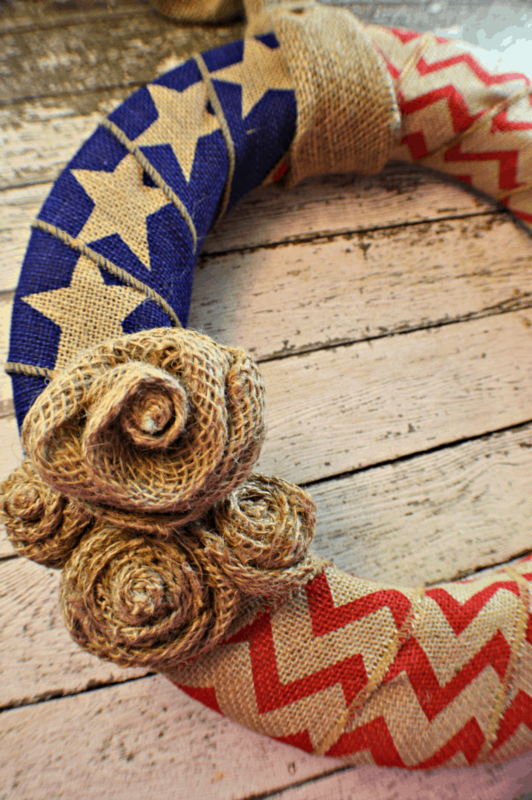 This patriotic wreath is super simple to make but looks stunning thanks to the red and blue flag ribbon. Whether you’re looking or a wreath idea for Memorial Day or the 4th of July you can’t go wrong with this accent ribbon design! 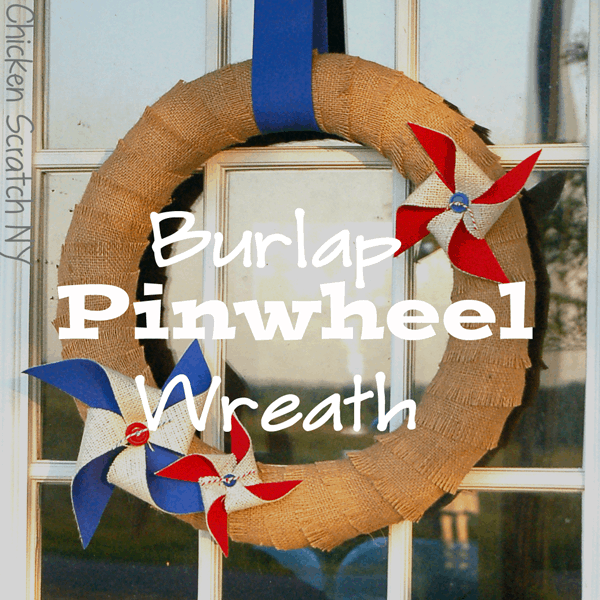 This wreath is really simple to make but the red and blue burlap pinwheels make it perfect for Flag Day! With the weather growing warmer and the flowers beginning to bloom it’s time for organza and birds for your Spring burlap wreaths! 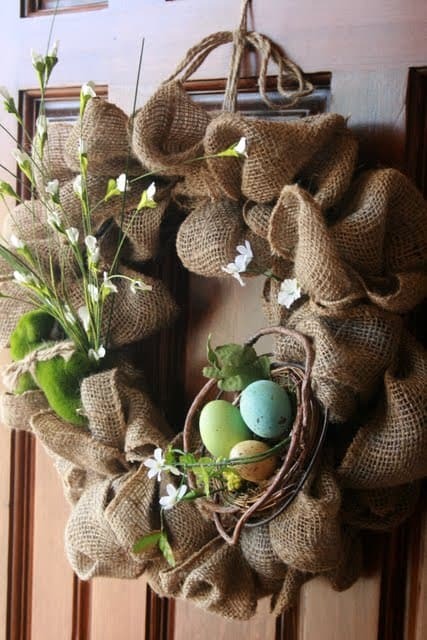 If you don’t have a lot of time to decorate your wreath for Spring check out this idea using a simple piece of organza. Ok we’re cheating with this one a little because it’s not actually a burlap wreath, it’s a yarn wreath but it has beautiful burlap flowers! We love this tutorial because it’s really easy to follow (with lots of photo steps) and the finished wreath is super cute. We love the idea of using little alligator clips to attach the flowers to the wreath so that you can switch them out at the end of the season. 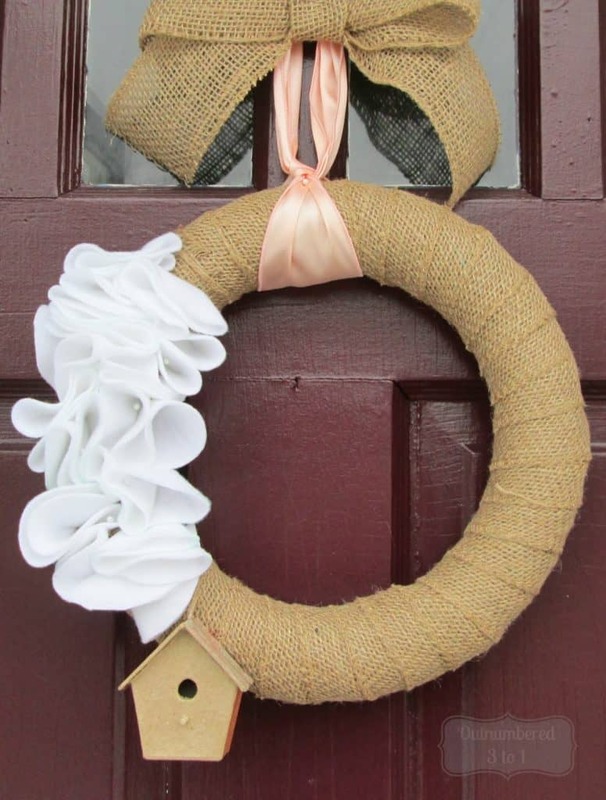 How cute is this wreath with that little teeny birdhouse attached? [You can get a similar one here] And such a clever idea to add that burlap bow on top to hide the knot in the ribbon. 5. 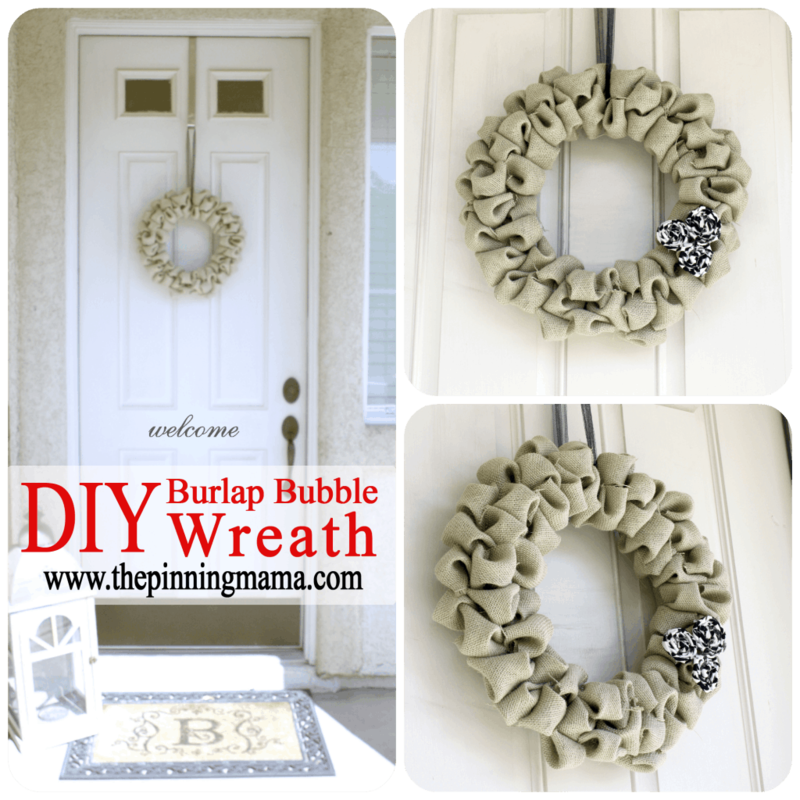 The Easiest Burlap Wreath You will Ever Make! First we had a birdhouse, and now we have a nest complete with eggs! See when you decorate your wreath by the season the only thing you are limited by is your imagination! In fact why not go one step farther and add a little clip on bird! 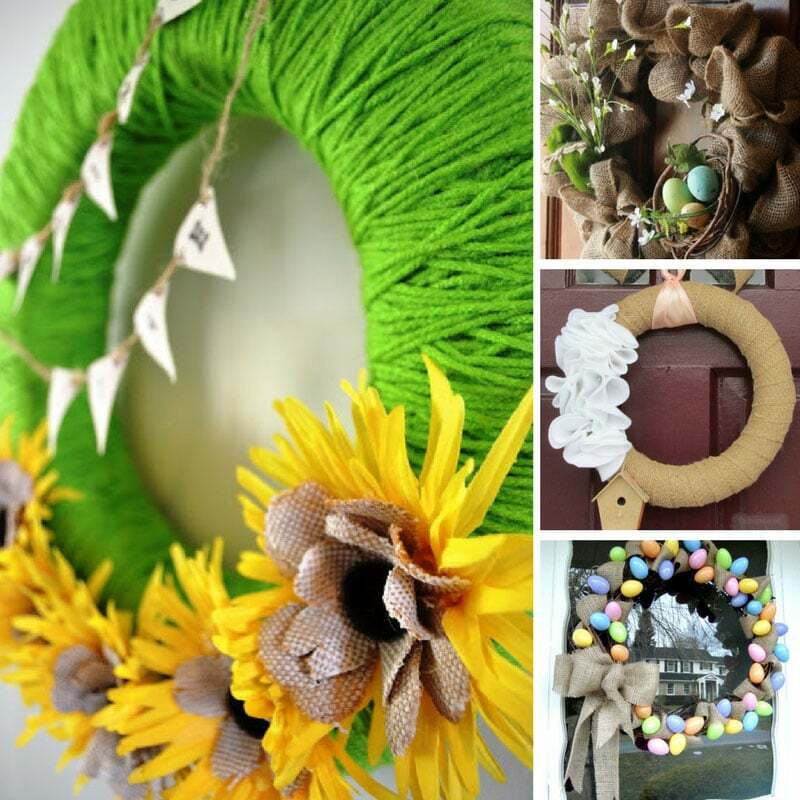 Just as you might want a separate design for Fall and Halloween so you might choose to have an Easter specific wreath as well as a spring one. So here’s some cute ideas to get those creative juices flowing! If you’ve got kids then you probably have a box full of these plastic eggs in the house, but we like how these eggs look a little bit more realistic. 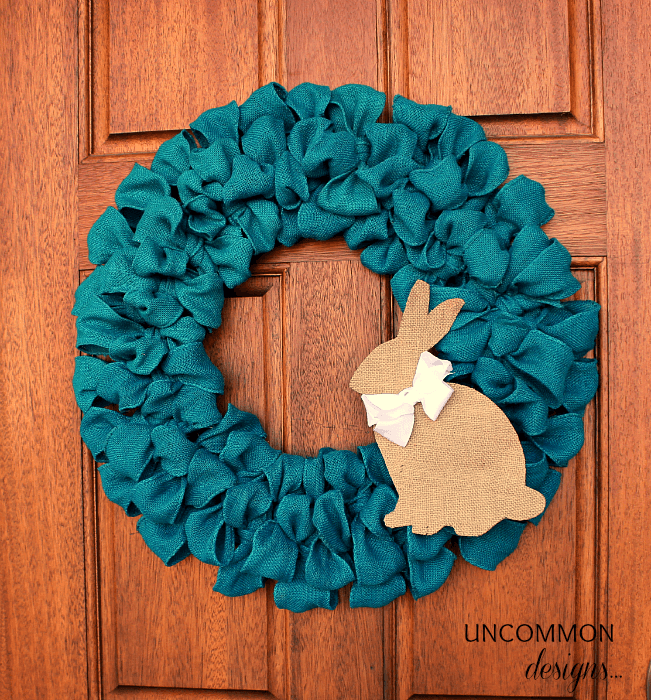 Here’s another example of a wreath using coloured burlap ribbon, the teal really pops, and the bunny rabbit is adorable! And there you have it – 26 gorgeous burlap wreath ideas to impress your guests and make your neighbors jealous!